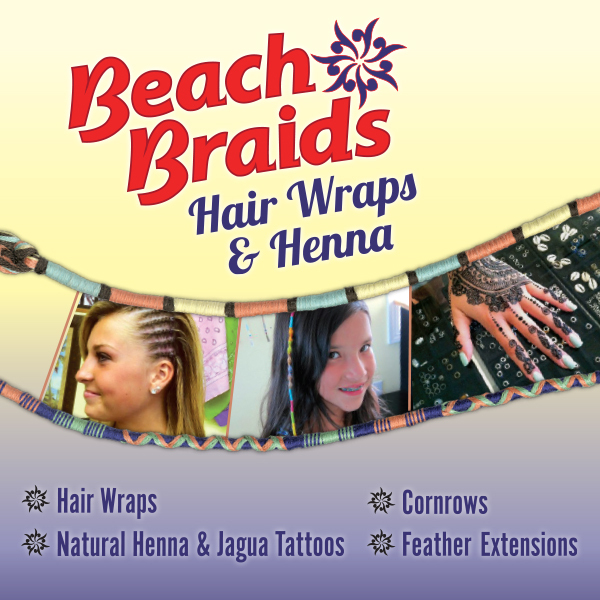 Beach Braids offers the best Outer Banks Hair Wraps, Henna and Mermaid Makeovers services! Stop in to one of our large air conditioned studios located in Corolla, Duck and Nags Head to get your cornrows or a colorful hemp or macrame hair wrap. We also specialize in freehand henna or jagua tattoos and offer a large selection of full color temporary tattoos. Family-owned and –operated, Beach Braids has been serving the Outer Banks since 2005. We have skilled henna artists, hair wrappers and braiders to provide you with a professional, exciting experience and the ultimate vacation souvenir. Our new mermaid makeovers offer a fun experience for both kids and parents alike. Makeovers include sparkling polish for fingers and toes, mermaid scale face design and colorful hair chalk style. This service is only available at our Beach Braids Duck location, open Monday to Saturday. Call for appointments and store hours at Beach Braids Corolla and Beach Braids Nags Head locations. We can accommodate large groups & offer group discounts. We have a large air-conditioned waiting room!